I read somewhere, don't recall where now, that if you want to work with fiberglass you should get up every morning and look into the mirror and say "I love to sand". Well, ever since my last post that is what we have been doing. Sanding, grinding, or whatever you want to call it, a LOT of it needs to be done if you intend to finish the surface and have it look anywhere approaching nice. Normally one would sand the entire surface smooth, apply the marine equivalent of body filler, then sand some more until everything was nice, even, and smooth. Sanding would include use of a special hand sanding block known as a long board to make smooth curves, and I've heard this can be quite tedious. In our case, we don't even have to sand a lot. 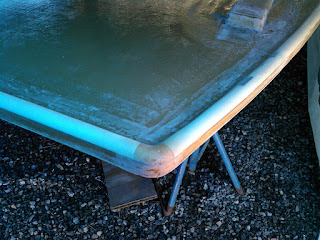 Outside of the fiberglass seams and the pattern of the weave of the fiberglass cloth, everything is pretty smooth. Most of the top side of the new bimini will be coated with gelcoat using a non-skid technique that will be thick enough to hide just about anything. 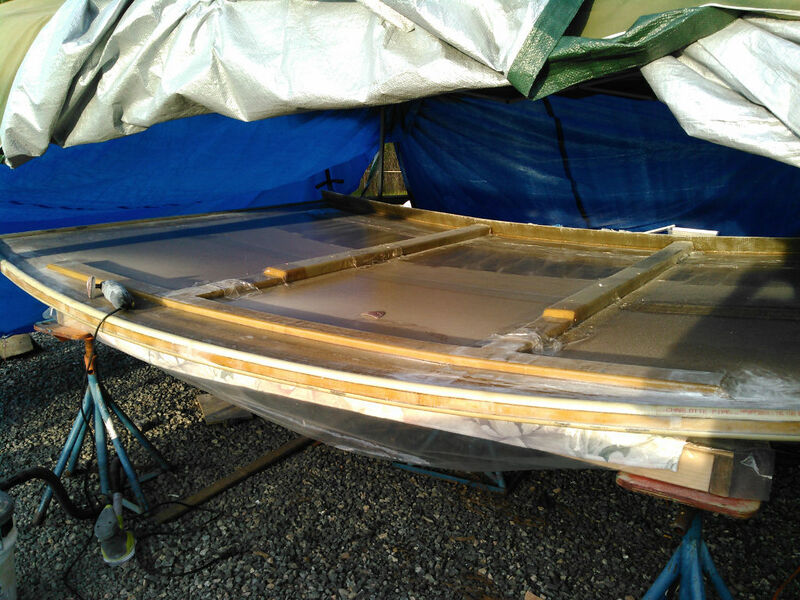 Most of the bottom side will be textured to reduce glare (yeah...that's the reason...definitely not because I just don't want to grind more fiberglass). So, the only bits that really need to be rather smooth are the handrail edges of the top and the beams underneath. And, for the most part, that is all we have been sanding...all week. The problem I'm having with sanding has partly to do with the type of resin I am using. There are two different types of polyester resin: laminating and finishing. Laminating resin is standard polyester and, since polyester won't cure in the presence of air, the surface stays tacky so additional layers can be easily added and will chemically link together. Finishing resin is polyester with an additive (a wax of sorts) that rises to the surface, cutting off exposure to the air, and this allows the resin to fully cure at the surface. When building the top it has been advantageous to use laminating resin so I can stop at the end of a day and resume the next day (or two). And since gelcoat is nothing more than polyester resin with color added, the laminating resin bond would be helpful there as well...as long as you didn't need to do much sanding. Sanding laminating resin where the surface hasn't fully cured tends to gum up sandpaper quckly. I could have used a finishing resin for the last coat (or added wax to the stuff I have or use PVA to seal the surface) so it would be easier to see, but then I would lose the chemical bond that will occur between the unsanded portions of the top and the gelcoat. I'm not sure which is actually a better way to go, but this chicken-and-egg problem I decided to bite the bullet and just try to sand the laminating resin. This took a lot of time and a lot of pieces of sandpaper. The remainder of the pain was just from sanding fiberglass itself. Fiberglass is rather tough stuff to sand, and the dust produced is, as I previously mentioned, extremely itchy. Every day for the last several days I thought "I'll finish sanding today and can start applying gelcoat tomorrow" and yet I would find more to sand. This is where being a perfectionist is definitely a detriment. One of these days I will learn that perfect is the enemy of good. This afternoon I finally reached the "good enough" point...or was it sick enough of sanding...and decided it was time to apply some gelcoat. At about 3 PM we applied some gelcoat to the back of the mounting flange. It was a good place to start and test any techniques since it will be mostly hidden once the top is mounted. Using a chip brush I applied two coats, making sure to brush the stuff on in different directions for each of the coats (I've been told this gives more even and complete coverage). The gelcoat I am using is a laminating resin as well, so after applying the stuff and letting it set up a bit (about 45 minutes), I had to apply PVA in order to seal out the air and let it fully cure. The PVA was also applied with a brush, this time a cheap foam brush. It did a good job of applying a thin layer of the PVA as best I can tell. By this point, the temperature was dropping below 65 degrees, so we broke out the space heater to help it cure. I think everything went well, but I guess we won't know for sure until we try cleaning off the PVA in the morning and try sanding the gelcoat smooth. And that, in addition to applying more gelcoat, is what will be on tap tomorrow...if the weather permits. Lucky you love to sand. 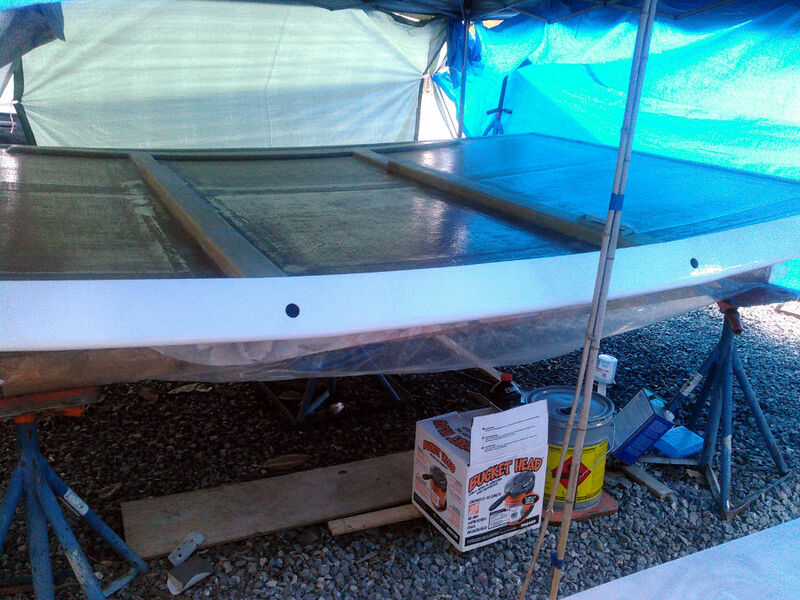 It must be a good feeling to see the bimini moving closer to a finish. Just the reflected light from the gel coat will make the inside of your refugee camp seem brighter and provide even more motivation. Good to be making progress, but frustrating that it isn't always complete. And I'm sick of fighting with the weather.